Why did you join the TMA? Many physicians become members because the Texas Medical Association represents the interests of physicians in state and federal legislation. Some physicians join to take advantage of the professional networking opportunities. Still others see the value in joining for the exceptional medical liability insurance through the Texas Medical Liability Trust (TMLT). We agree that these are all excellent reasons to join the TMA. Research shows that many members of the Texas Medical Association join for one reason, and only take advantage of that one benefit of membership. However, many do not go on to discover all the other benefits available to them as a members. One of those benefits is free, no-obligation assistance in researching and signing up for health insurance – whether that insurance is for yourself, your family, or your medical practice. TMA Insurance Trust advisors have decades of experience, and their goal is simple: to protect your financial interests, from residency to retirement. Many physicians have already obtained health coverage for the new year, while others are still struggling and have not yet found the right plan. We understand that choosing a health insurance plan is a complex process. Each new year, there are changes, and a great deal of options to consider. For each plan, you must take into account: Is your current physician part of the network? Will this particular plan cover visits to a particular facility? How will the copays and deductibles affect the overall value of the plan? How comprehensive is the prescription drug coverage? When you must choose a plan for your staff, the questions and considerations become even more complicated. 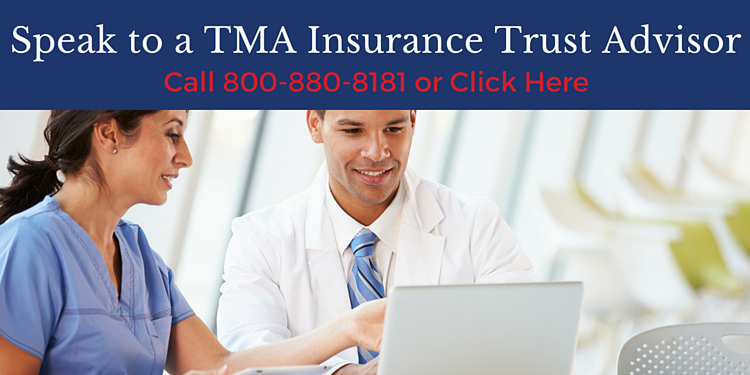 The fully licensed health insurance advisors at TMA Insurance Trust are available to help you during these final days of open enrollment. They are ready to research your options, prepare informative quotes, and help you sign up for coverage before the deadline passes on January 31. You have better things to do with your time than research and compare insurance policies. As time runs out for open enrollment, why not take advantage of this benefit of your TMA membership? The services of TMA Insurance Trust advisors are completely free to TMA members. Join the hundreds of medical practices and individual physicians across the great state of Texas who have taken advantage of this complimentary service and purchased health insurance for themselves, their families, or their practice staff. TMA Insurance Trust is ready to help you. We have health insurance specialists available to assist you during Open Enrollment and beyond. Call us today.